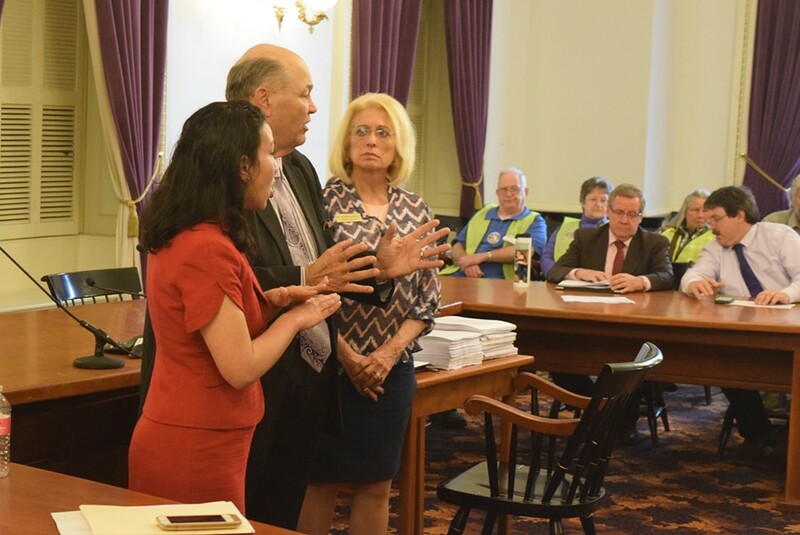 Reps. Kesha Ram (D-Burlington), Mike Hebert (R-Vernon) and Marianna Gamache (R-Swanton) speak about an energy siting bill Friday at the Statehouse. After four long months of angst-filled debate over a renewable energy siting bill, a group of wind-energy critics sat late Friday afternoon in the Statehouse cafeteria munching on not-very-fresh-looking turkey sandwiches. “We’re not happy,” said Penny Dubie, a Fairfield resident who has been hotly fighting the siting of wind projects since a seven-turbine Swanton project was proposed near her house. Legislators had just reached a final agreement on the bill and it didn’t go as far as the critics would have liked. “I’m between a rock and a hard place,” said Rep. Marianna Gamache (R-Swanton), who favored portions of the bill designed to give towns more say in locating energy projects but was disappointed that new sound standards wouldn’t apply to the proposed Swanton project. Over the last few days, plenty of people on all sides of the renewable energy siting issue have been unhappy, taking turns lashing out over what the bill will or will not do. The governor threatened to veto it. The House and Senate each threatened to kill the bill. 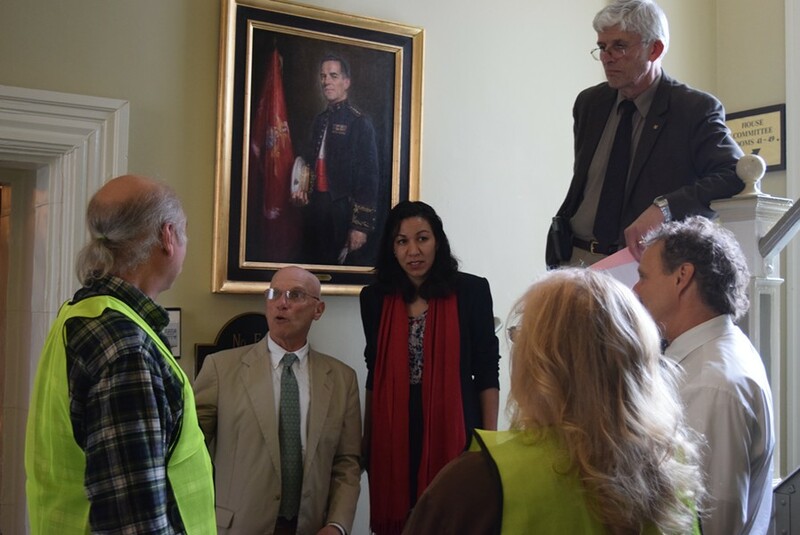 The group of wind critics, who came daily dressed in neon green vests, paced the halls, determined to remind lawmakers constantly of their presence. It was one of the last bills to come together as the 2016 legislative session drew to a close. Rep. Tony Klein (D-East Montpelier), center, speaks to renewable energy critics in the Statehouse hallway Thursday. The final result was a bill that eases some of the angst over the siting of wind and solar projects, but Friday’s fights affirmed that no solution is likely to resolve all of it. “I don’t believe it solves the problem. It moves the dial in the direction it needs to be moved,” said Sen. John Rodgers (D-Essex/Orleans), who would like a moratorium on wind projects. The bill offers Vermont towns the potential to have more say over where renewable energy projects are sited within their borders, if the towns create appropriate energy plans. It also would require radar-controlled lights on wind turbines, which Rep. Kesha Ram (D-Burlington), vice chair of the House Natural Resources and Energy Committee, touted as a first-in-the-nation standard that will be less disruptive to neighbors. The trickiest measure of all in the bill, however, was directing the Public Service Board to set new sound standards for wind turbines, first through emergency rules and later through permanent rules. Critics, who argue their complaints over wind turbine noise go unheeded, are hoping for lower sound limits. Gov. Peter Shumlin sent a clear message to lawmakers Thursday that the way that portion of the bill was then written was a “no-no,” Rep. Tony Klein (D-East Montpelier) said. Shumlin’s staff argued that it would amount to a moratorium on wind projects. The green-vested wind critics buzzed with fear that the bill would die. Late Thursday afternoon, Klein tried to ease their fears. “You’re dealing with a dude that’s on his way out,” Klein told a group of critics, trying to explain the retiring governor’s intractable stand. “I want the bill to pass,” said Klein, who is also retiring. By the next day, the wording had been altered to bring Shumlin back on board. But late Friday afternoon, it was Klein who was furious, claiming that Senate conferees had insisted on changes that could force wind developers to comply with very low sound limits. He stormed out of a conference committee meeting, refusing to sign onto the final agreement. “I wanted it clear and I got overruled,” Klein protested. Within an hour, Klein had changed his mind, reassured by lawyers that the wording would work. The House and Senate each signed off on the bill without a voice of dissent. Gamache had decided to support the bill in hopes that it succeeds in giving towns greater control over siting of projects. But in the next breath, it was clear she didn’t consider the issue resolved.